Time:Day 1: Mix Batter, Day 2: Add in baking soda and cook. Mix the starter together with the milk and water, allow it to sit for a bit if you can’t get the start mixed in well. You don’t want too many large chunks of starter. Just before cooking the waffles, beat in the baking soda. This will deflate the batter, if it has risen significantly. 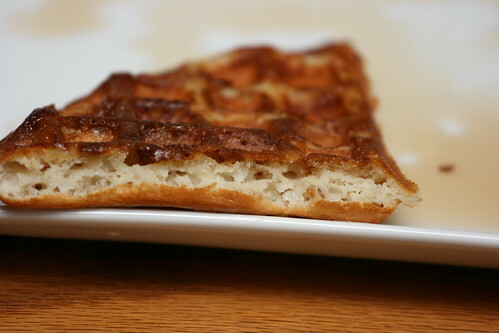 Cook the waffles in the waffle maker. 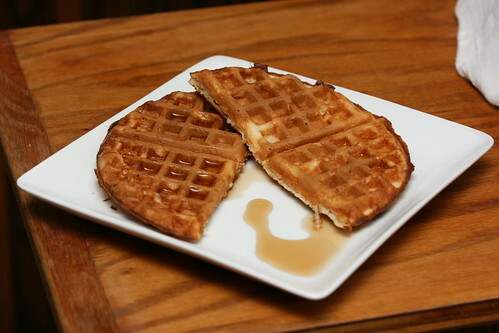 And, finally, eat your delicious waffles! These are super easy to make, and a great way to use a little bit of extra starter you might have left over. 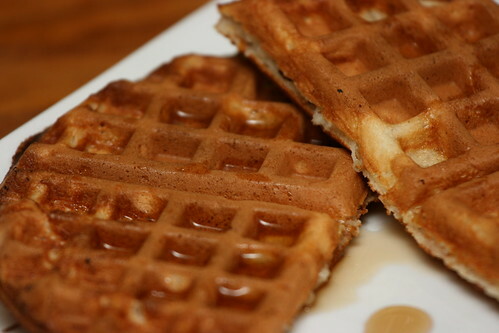 In the future I’ll have to try them with some whole grain flours, as I tend to prefer waffles/pancakes made from some sort of multi/whole grain flour mixture. So, back to YeastSpotting this week after quite a hiatus, hopefully next time it will be an ‘actual’ bread!